If you absolutely need to know what the weather will be like in the following days and you own an Android phone then we have a widget ready to do that for you. The Koxx Weather Forecast is a freeware application which brings you Google and Noaa weather forecasts straight to your home screen. You can choose between 1x1, 2x1, 2x2 and 4x1 icon widgets according to your needs. In order to get more information simply tap on the widget and get detailed forecasts for the next few days. 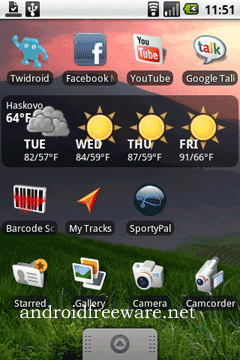 The widgets are placed neatly on your phone and they will be automatically updated. Ready to get more weather to your phone? Follow the link below!